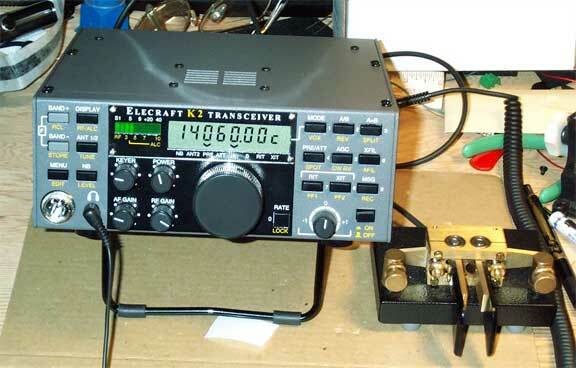 The Elecraft K2 is a ham radio HF transceiver that is available only as a kit. It took me over a year to decide to purchase one. 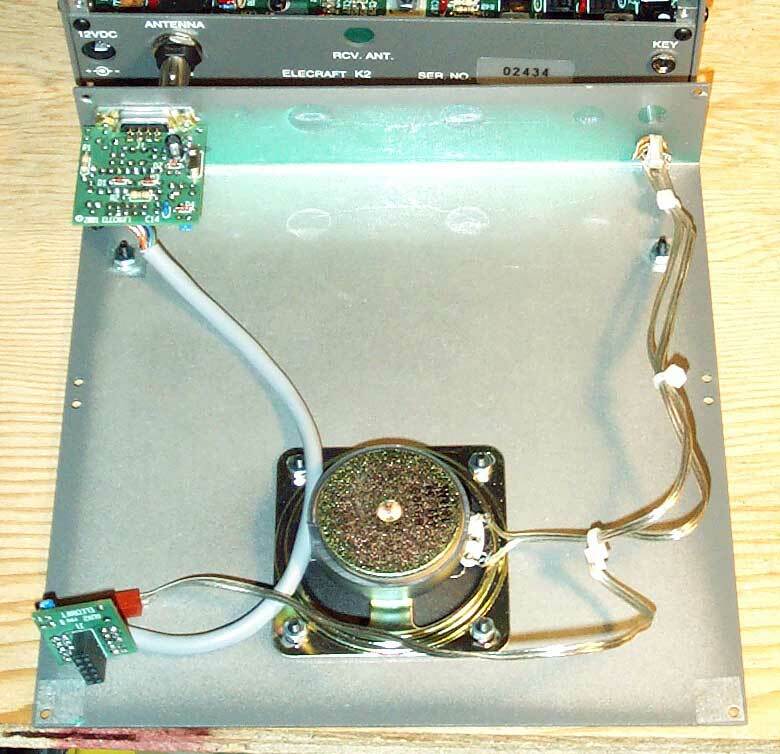 I first saw the rig at the 1999 Dayton Hamfest and liked the idea of a full-featured QRP rig to which a 100 watt PA could be added as a removable option. I have been interested in designing and building circuits since I was a teenager, and I've built a number of electronic kits. Before building the K2, the best kit I'd built was the Wilderness Radio Sierra. The Sierra is a small QRP rig designed for backpacking. It's much less sophisticated than the K2, but I successfully used the Sierra in ARRL Field Day events from 1997-2001. 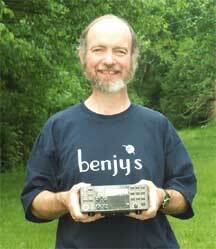 See my QRP Field Day pages. The K2 had a great reputation among builders and operators. It was tested by an independent group and found to have one of the best receivers among commercial ham rigs. It met a number of my needs. I wanted to upgrade from my Ten-Tec Omni-C, circa 1980, which is a great rig. But, it drifts, it takes up a lot of table space with it's external VFO, and it's too big for portable operation. 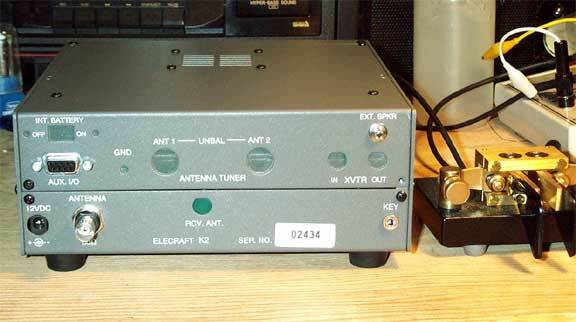 The K2, with the 100 watt PA, could serve both as a home station rig and a portable QRP rig. I wasn't sure how successful I'd be building the kit. Because of other commitments, I did not know how long it would take to build the kit. Well, I finally ordered the K2, the SSB option, and the noise blanker before Christmas of 2001. (Actually, the options were Christmas gifts from my wife and her family.) The kit, S/N 2434, came on Christmas Eve. I inventoried the parts in December and began building the rig in January. I worked anywhere from 30 minutes to two hours on the kit, five or six nights a week. I finished the base kit and made a contact on March 2, 2002. I estimate it took about 60 hours including solving a big problem described below. The SSB option took about 9 1/2 hours, and the noise blanker took about 3 hours. The two options were completed on April 7, 2002. After that, I purchased an RS-232 control interface and completed it in about 4 1/2 hours. I plan to purchase the 100-watt option soon. Update: I completed my KPA 100 in September, 2002. I really like this rig. Some days when I don't get a chance to operate, I'll take a few minutes to sit and look at the rig. Sometimes, I stroke it fondly. The rig is full-featured and customizable with add-on options, through modifications, and by parameters configurable through the menu system. The controls are easy to use and intuitive. It's a real joy to operate! The receiver sensitivity is great. After building the kit, I had a vague suspicion that the receiver wasn't receiving weak signals as well as my old Ten-Tec Omni C. Over a period of weeks, I performed a number of subjective tests between the two rigs. My final estimation is that the K2 outperforms the Ten-Tec on 20M and below. On the upper bands, the two rigs are comparable, although I haven't performed extensive tests on 10M. It's great to work FB QRP or 10 watt DX using a rig that I built while enjoying features not typically found on QRP rigs. I'm used to Ten-Tec's excellent QSK. The K2 fails to match it. I'm used to hearing between my dits above 20 wpm, but the K2 fails to perform this well, even with the QSK mod. Other owner's report that they like the QSK on the K2, but Ten-Tec is a hard act to follow in terms of QSK. I'm still working on trying some adjustments and tweaking the mod. It's annoying that the rig does not transmit when keyed immediately after a band or mode change. So, if I tune in a DX station and send my call, AC4XO, it comes out C4XO the first time after a band or mode change. The tuning knob is a bit rough on the hands if you try to spin it using the sides of the knob. Some owners have replaced the knob with a knob from a commercial HF rig. The Spot function is more difficult to use than the Zero Beat function on my old Omni. Spot produces a tone at the frequency of your CW offset. The idea is to zero beat this audio pitch with the CW signal you want to work. Some users of the K2 find this method a bit difficult. All and all, this is a great rig and a great kit. I'm glad I purchased the kit and that I built it myself. 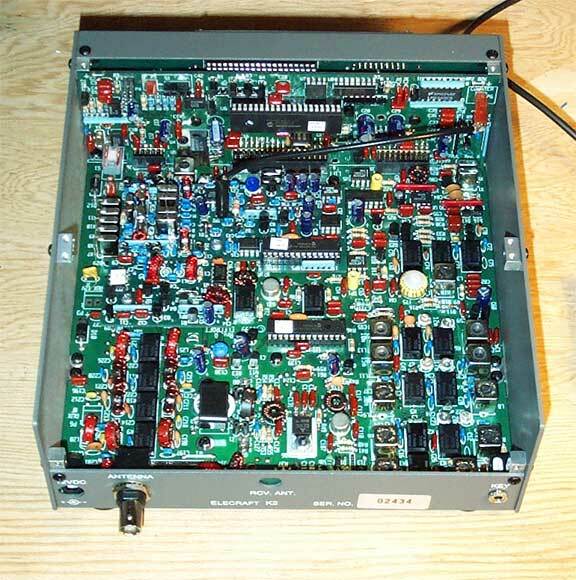 Although, Elecraft says this is a intermediate kit, I'd call it advanced. Elecraft support is great! They offer e-mail support, which is very good, and they have an excellent web site which includes PDF versions of the manuals for the rigs and options, modifications by Elecraft and others, and an e-mail reflector. The kit is very nicely done. It contains quality parts, great solder mask boards, and clear instructions. 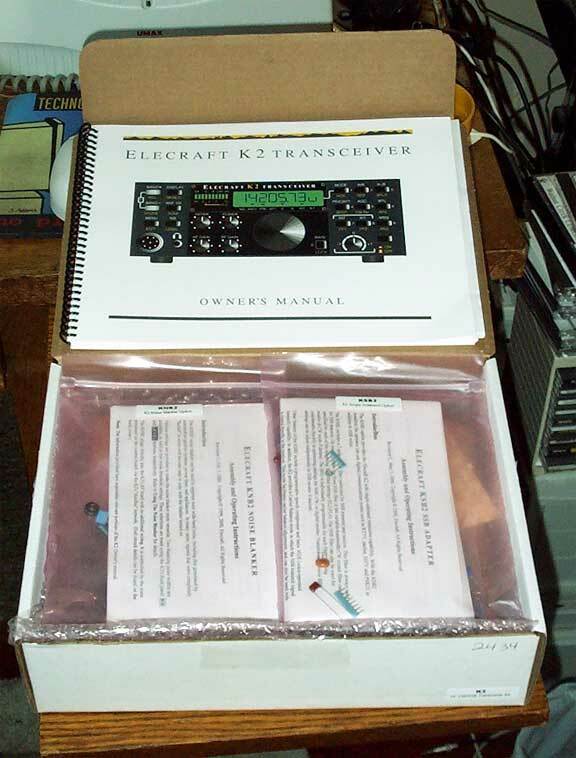 (You can download the manuals from the Elecraft web site before purchasing, if you want to see how clear the instructions are.) 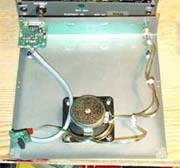 The base unit is built around three PC boards: the RF board that fills the bottom of the rig, the front panel board, and the control board. 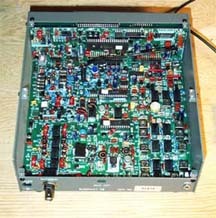 The front panel and control boards plug into the RF board. One nice thing about the kit is that the resistors come on a tape in the order in which they are installed. I'm red-green color blind, so I really appreciate having the resistors pre-sorted. (The options I built don't have pre-sorted resistors, but there aren't enough resistors in the options for this to be a problem). The kit is near perfect. The only real complaint is the description of the double-sided tape that is used to hold a bezel in place. The problem with the instructions is the tape isn't typical in that what you really have is some clear glue between two backings. Once the rig is built and aligned, then you can build options. I built the SSB module first and then the noise blanker. I found the SSB option to be more difficult than the base rig. 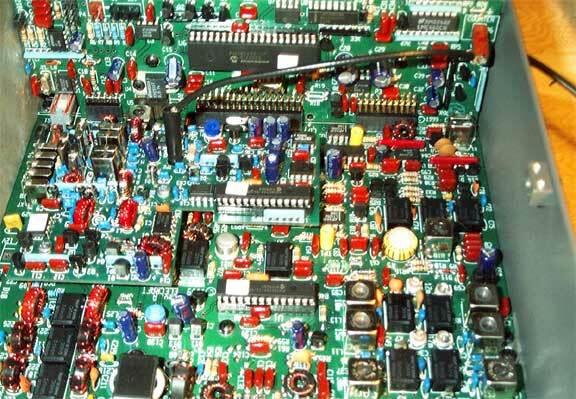 One section of the board has closely spaced components, and the solder pads are more like solder rings. I also found it hard to mount some of the capacitors close to the board because of their lead spacing. I had a number of problems during the construction. Most were not major. I encountered a problem while installing the power switch. I was holding the switch in place before soldering, and it appeared to be flat on the board. But, after soldering, I noticed that the switch was rotated a bit. I got some help from Mike, N4GU, who was able to heat three pins of the switch and bend the switch in place. The main problem I had was discovered at the end of Part II. The first step in the testing and alignment phase of Part II was to check the PLL reference oscillator frequency. The oscillator wasn't working. 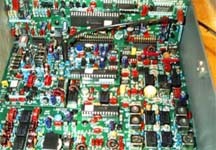 I exchanged e-mail with Gary, AB7MY, at Elecraft about this problem and he gave me many good suggestions based on his experience troubleshooting K2's. He was very patient. I spent about a week thinking about and troubleshooting the problem. I cleaned up solder joints and tested connections, but the oscillator was still dead. I finally removed the capacitor connecting the reference oscillator to the next stage, and the oscillator started working. It didn't take me long after that to find a solder bridge on the component side of the board. It wasn't visible with a magnifier, but by eliminating other possibilities, I knew where the problem had to be. A little heat and solder-wick did the trick. Had I thought about it, I could have used an ohm meter to look for this short at the input of the next stage. That would have saved me a lot of time. It was smooth sailing after that problem until I got to the options. I had four other soldering problems. The first three were "not soldering" problems. I think had I had a better magnifier, I wouldn't have missed these unsoldered pins. I did check the boards visually, but, had I been a bit more careful, I could have found these problems earlier. In any case, it only took a short time to trace these problems down. 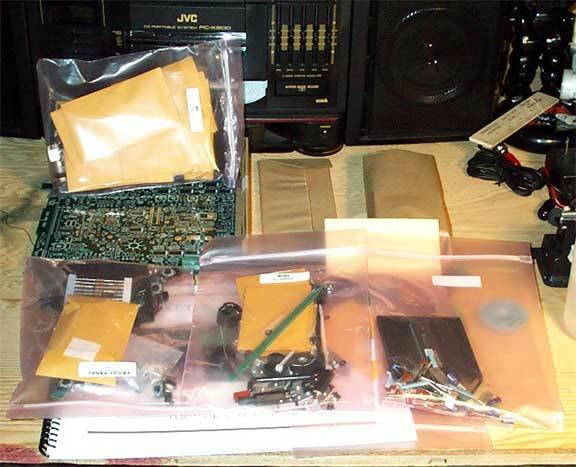 Thanks to my wife Sue Ellen, KD4LQO, for her positive support while I was building the kit. I used the K2 for Field Day 2002. The rig and CW filters worked great! The AuxIO Board (serial interface) worked well with the NA logging program. After building the K2 and the KPA100, I discovered a problem. See my Final Thoughts page for a description of the problem and some final thoughts on Elecraft kits. Benjy Cline, AC4XO July 1, 2002 Updated 9/29/02.